As the Ebola virus outbreak continues to rage in West Africa, the pressure is on to fast-track drug research that could potentially stop or slow its spread. Last week, the National Institute of Allergy and Infectious Disease (NIAID), a division of the National Institutes of Health, announced plans to expedite research on a vaccine against Ebola that's been shown to be effective in primates. A clinical trial on humans may begin as early as next month. "We tested it in monkeys, it looks very good, it protects monkeys completely from challenge with Ebola. They don't get sick and they don't die, whereas unvaccinated monkeys all do," Dr. Anthony Fauci, director of NIAID, told "CBS This Morning" on Monday. "We're going to start human trials in September in normal volunteers. And if that looks good, by January we should be able to scale up in its production." He said the vaccine could eventually be offered to health care providers who put themselves at high risk taking care of others in an outbreak. Scientists at the Vaccine Research Center said that, unlike vaccines for many other communicable diseases, this particular one does not contain any of the pathogens that cause the Ebola virus. "This is a non-replicating viral vector, which means the vaccine enters a cell, delivers the gene inserts and does not replicate further. The gene inserts express a protein to which the body makes an immune response," according to a statement from the NIAID. In next month's trial, the vaccine will be tested on healthy human volunteers, which will provide researchers with information on any contraindication and side effects the drug may pose, as well as help to determine what dosage would be needed to make it effective for preventing illness. It would be unethical to conduct a randomized trial of any Ebola treatment or vaccine in people who were infected since only a fraction of study subjects would receive the potentially life-saving therapy. But it isn't the only vaccine that's in testing or has shown promise. Thomas Geisbert, a professor in the department of microbiology and immunology at the University of Texas Medical Branch at Galveston, has been working on research for a number of potential vaccines that may hold promise for preventing the spread of the Ebola virus. He told CBS News there are at least four other vaccines in development -- and all show some potential to be effective in humans. Geisbert said one such vaccine might be effective in a single dose, much like a rabies shot, rather than requiring two or three doses. This would be a boon for public health efforts in poor countries because it would eliminate the need for follow-up visits with patients. But progress for this vaccine and others has been slow. Geisbert, who received a $26 million grant from the NIH for Ebola vaccination research, said lack of funding is a large factor in why little progress has been made. "Because there's really not been that many cases globally, there's a small global market," Geisbert told CBS News. "There's not a lot interest from pharmaceutical companies. There's no incentive for the private sector, so you have to rely on the government." The current outbreak in West Africa, which has taken the lives of 887 people to date, has prompted increased funding for vaccine research. But a vaccine, even if it works, won't be enough to stop an epidemic. To do so would also require having treatments available for those people who contract Ebola. "People need to understand the difference between a treatment and a vaccine," Fauci told CBS News. "What I was talking about, which we have really some very favorable results on, is a vaccine to prevent infection." One potential treatment for people after they become infected has already made its way to West Africa. Last week, several vials of an experimental drug serum called ZMAPP were transported to Liberia from the NIH in an effort to treat two American aid workers with Ebola. The serum contains antibodies to prevent the virus from entering cells in the body, CBS News chief medical correspondent Dr. Jon LaPook explains. The health of both patients improved shortly after taking the drug. However just two case studies aren't enough to determine if it would be an effective treatment for people in the long run. Dr. Kartik Chandran, associate professor of microbiology & immunology at Albert Einstein College of Medicine, is studying the way the Ebola virus behaves in humans. "Our work is really focused on basic understanding of how the virus infects the cell. We are using that information to develop drugs against Ebola," he told CBS News. Chandran has discovered Ebola is a sneaky and aggressive pathogen. "The virus is like a burglar trying to get into a house, a mansion," he said. "This mansion has lots and lots rooms and cul-de-sacs and dead ends. Every door has a lock, there are surveillance cameras and the virus needs to break in. By identifying the key doors it could get through, we can come up with targets." The virus essentially enters human cells by hitching a ride with certain proteins. 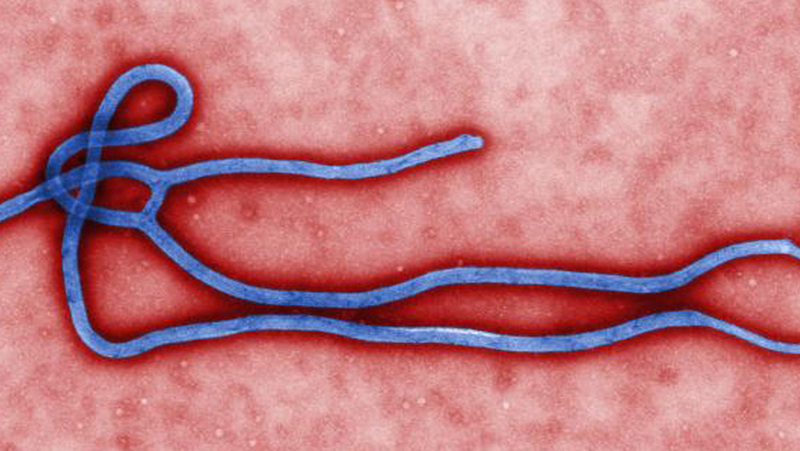 The Ebola virus binds to the host cell's outer membrane, then part of the host cell membrane envelops the virus. This creates a bubble of sorts, which enables the virus to enter into the cell. The virus escapes destruction by exploiting the cell's regeneration process. One protein the virus exploits in known as the Niemann-Picks CI (NPC1), which helps transport cholesterol within a cell. In a mouse study, Chandran and his team discovered that if cells do not make this protein -- due to a mutation -- they are immune to Ebola. This research was supported by grants from the NIAID and the National Human Genome Research Institute, both part of the National Institutes of Health, the U.S. Army, and the Burroughs Wellcome Fund. Chandran said a drug that blocks the virus from binding to the protein may be a potential treatment for people who contract Ebola, though development is some time away. "Every time you identify another one of the cells this virus is exploiting, you can target them to block the virus," he said. "There are other approaches. There's the therapeutic antibody approach -- you make antibodies against the outer shell of the virus. You inject them and infuse them into a person."